From 1914 to 1919 the Town Council voted upon issues concerning roads, housing, health, public services and the workhouse, and their meetings were reported every week in the Western Gazette. In addition it had to deal with the particular circumstances arising from the war. In early 1914 one of the main concerns of the town council was re-surfacing roads, as the increased amount of motor traffic, especially steam driven engines, was causing serious damage to traditional crushed stone road surfaces. The council was advised to lay down tarmacadam, but it was expensive. However, borrowing money to pay for the cost was out of the question during the war. Local government boards and other boards were calling on all public bodies to reduce their expenditure wherever possible. Shaftesbury Town Council was already saving money by discontinuing street lighting, saving £250 (equivalent to £20,000 in 2017) per year. The Lighting Committee lost a motion to provide public lamps at five dangerous sites in the town as it would cost money, and because lighting the town might increase the threat of Zeppelin raids. All vehicles were required to have lighting and many of the minor cases heard in the Shaftesbury Petty sessions related to lighting offences. The council agreed in 1914 that the Town Hall could be used for recruiting soldiers, and the Market Hall for drill practice. By Christmas, pub opening hours were temporarily reduced, closing at 9 pm, due to the large number of recruits in the town. Drunkenness among recruits was common, as pubs and local people ‘treated’ the men who were billeted in the town, and the town’s numbers swelled at weekends as men from the nearby camps came for some entertainment. A letter was received by the Town Council, requesting that buckets should be placed around the town, to cater for the Nelson Battalion shortly to be billeted in the town. With reference to my call upon you regarding the proposed one night’s billeting of the Nelson Battalion in Shaftesbury on Wednesday night, 17th inst.,I now write to ask you if you can possibly make arrangements through the Borough Sanitary Engineer, for latrine buckets to be placed in convenient positions to our billets, these buckets to be removed by the Borough Authorities on Thursday morning after we leave. If you could manage to arrange this, what would be the expense? If you can manage to arrange this, it will be a great help to me. 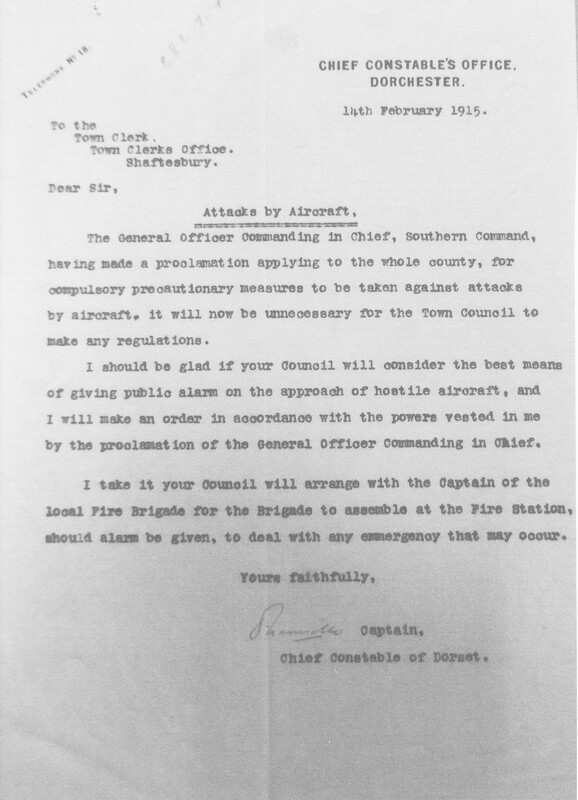 Shortly afterwards the Town Clerk received a letter from the Chief Constable’s Office in Dorchester, warning of the danger of attacks from aircraft, and the need to alert the public in the event of enemy action. The Fire Brigade was required to ready themselves as soon as the public alarm was given. The public were advised to shelter in cellars, and to cover all lights at night. Town lighting was to be extinguished as soon as the alarm went off. Drivers were asked to minimise using lights, and consequently there were several accidents at night. The police alone were to be responsible for sounding the alarm, to prevent scares or practical jokers. In 1916 the Town Hall clock was silenced at night at the request of the police, under the Defence of the Realm Act. The council gave £10 to the memorial fund for Lord Kitchener who drowned off the Orkney Islands in June when his ship hit a German mine. In August 1916 the Poor Yard in St James was ordered to be closed, and the houses there were subsequently knocked down and replaced. In 1917 the River Stour flooded in Gillingham, and roads in Cann, Margaret Marsh and Fontmell Magna were seriously damaged by traction engine traffic servicing the Salisbury, Semley and Gillingham Dairy Company. The local surveyor was asked to obtain German prisoners-of-war to work in the quarries, extracting stone for road surfacing and repairs. Messrs Marsh and Barter were paid £39 (worth £3200 in 2017) to spray the streets with water in dry weather, as the council was unable to afford the new asphalt surface which was their preferred option. In November 1918 just after the war ended, Alderman Norton was elected mayor for the third time, as Dr Harris, the previous mayor had retired. Dr Harris had been very active during the war, both as mayor, and the leading medical figure in the town. The town had been sold in September 1918 to a Mr White, a London businessman, and there were fears that the town would suffer from having a non-local owner. 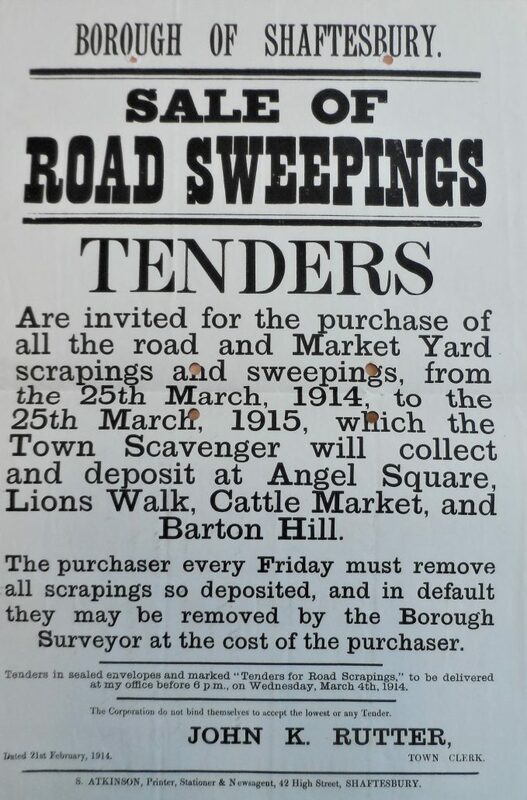 After the war ended there were still restrictions and shortages. In December 1918, an order limited the amount of coal delivered to households to one ton, and coal merchants were forbidden to deliver more than three tons to any one house in two consecutive weeks. At this time nearly all domestic heating and cooking used coal, so a cold winter meant hard choices. By 1919 the town was recovering from the effects of war, but it still dominated council meetings. A resolution was made to buy goods only from countries who were allies, and to prefer British companies where possible for the peace celebrations’ expenditure. In February 1919 proposals for a war memorial were discussed, and it was decided it should be a substantial one, whatever was eventually chosen. In March 1919, although peace had not been achieved throughout the conflict area, the Mayor, John Norton, was keen to plan celebrations and not leave them till the last moment. 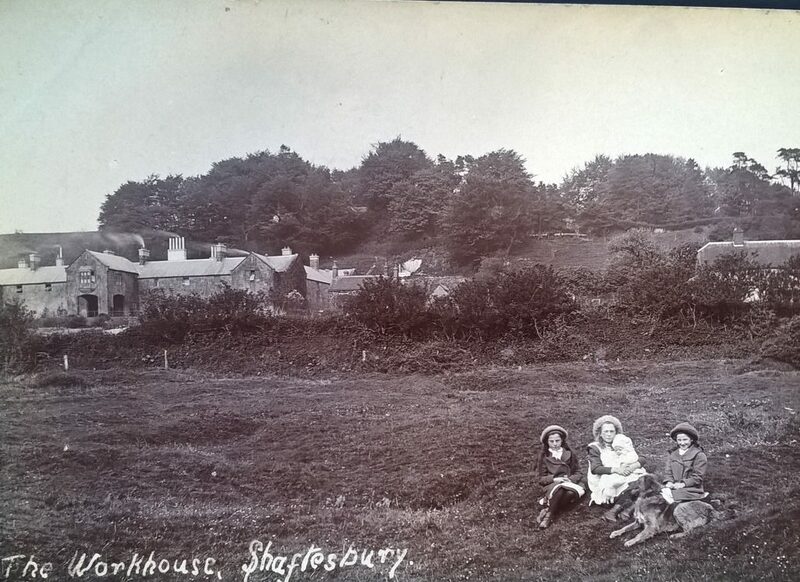 However residents in Shaftesbury were anxious about the imminent second sale of the town, and it was felt celebrations would be enjoyed more once the matter was settled. The council also resolved to have the town’s musical instruments overhauled with a view to setting up the town band again. Proposals to install a light railway connecting Salisbury, Shaftesbury and Dorchester were raised and referred to the County Council, but it was never built. In April, the council discussed the building of new homes in Shaftesbury, as part of a government scheme. 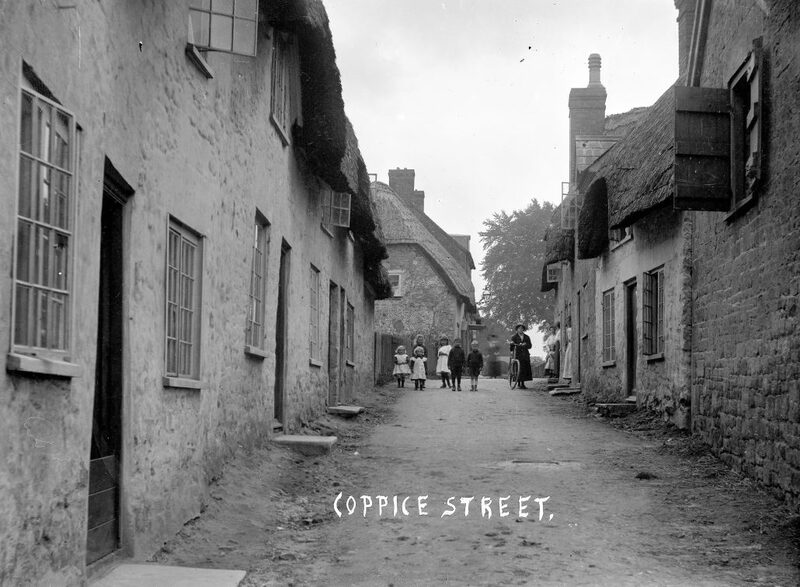 Sites were proposed and accepted in Angel Lane and Coppice Street. Dr Harris offered to give a site on Castle Hill behind the gas works for eight to ten houses, which was also gratefully accepted. Shaftesbury was fortunate to have Superintendent Richard Hussey in charge of law and order in Shaftesbury during the Great War. Richard Hussey had been promoted to the rank of Superintendent in October 1913, and shortly afterwards left Dorchester to take charge of policing in the town and district. He was a widower with two daughters, and his sister-in-law, whom he later married in 1919, came to Shaftesbury with him to look after the girls. The family lived at 29, Bell Street, and the police station was further down Bell Street where the library is now. The white posts topped with crowns are all that remains of the police station today. Superintendent Hussey took great pride in getting to know his ‘patch’ and was supported by a deputy and 11 men. Initially much of his time was spent in dealing with outbreaks of cattle disease and quarantines, but with the outbreak of war in August 1914, his responsibilities increased greatly. His first major task in late summer 1914 was to arrange the billeting of six to seven hundred new recruits, ensuring that their temporary homes met the required standard, and that the recruits behaved themselves. He managed this with tact and efficiency and was commended for his ability to liaise between the town and its large intake of men. His task was made more difficult when some of his constables joined up, but he managed splendidly, as after the billeted men had gone in 1915, he was thanked warmly for his efficiency and effectiveness as billet-master. • Two men were summoned for cruelty to a pig being brought to Shaftesbury Market. The pig fell from the cart in which it was travelling and broke its leg. One man was fined 10/-. • Driving vehicles without lights was a crime which came up regularly in the courts, and one offender, William Coward was fined 7/6d. Several cases involved the apparent misappropriation of H.M. Army property. In one case, John Gray of Shaftesbury was summoned for being in unlawful possession of a pair of Australian military boots. He claimed that they had been thrown out to be burnt by the Australian army. At least four other men were similarly charged, but the defence solicitor, Mr Rutter, argued that there was no proof that they had acquired them unlawfully, and all the cases were dismissed. All visitors to the town had to register at inns under the Aliens’ Restrictions Act, and failure to do so resulted in a fine. In 1917 a visitor from Weymouth and his ‘wife’ failed to register when they stayed at The Mitre Inn. When the woman absconded in the night after robbing the man, he reported it at the police station the following day, and was subsequently fined 10/- for failing to register. History does not record if he ever came back to Shaftesbury after his unfortunate experience. A special children’s court was held for minors, usually dealing with thefts and anti-social behaviour. Parents could be fined as well as their children. Superintendent Hussey reported serious complaints concerning young people obstructing footways in the High Street, particularly on Sunday evenings. The magistrates supported police efforts to stop this anti-social behaviour and fined three boys from Enmore Green. In April 1920, Superintendent Hussey was transferred back to Dorchester to take over the Division where he had started his career. He retired in 1923, and the Dorset County Chronicle published a fulsome article on his career, writing “As to Superintendent Hussey’s work in the police courts, nothing but the highest praise can be written”. Adults lived at the workhouse in Umber’s Hill, but from 1912 children were housed in the Cottage Home, which was thought more suitable for them. Regular reports published in the Western Gazette showed that both were well run. Boys over eight years old were not allowed to stay with girls, so an arrangement was discussed with Sturminster Newton Union, with one cottage home taking the girls and the other, the boys. In 1914 Lady Stalbridge offered to pay for a help for the Cottage Home; one of the guardians protested that the girls should learn to darn stockings, peel potatoes ‘and such like things’ at an early age to fit them for later life. However he was overruled as the committee did not want to upset Lady Stalbridge or as they put it, ‘throw dirty water in her face’. In 1916 Shaftesbury Union workhouse was found to be very clean and the residents comfortable, despite the economies necessary during the war. In 1918 the inmates were treated to Christmas dinner, and appeals were made for holly and other evergreens to decorate the workhouse. Coal allocations were distributed to ‘the outdoor poor’ with the guardians themselves arranging delivery to their respective parishes. The guardians also discussed how to improve provision of relief to the poor, overhauling the current system. After the war, in 1923, the workhouse was still fully functioning, and at Christmas the inmates were treated to a tea and musical entertainment. The men all received tobacco and the women one shilling (worth £4 in 2017) and oranges. 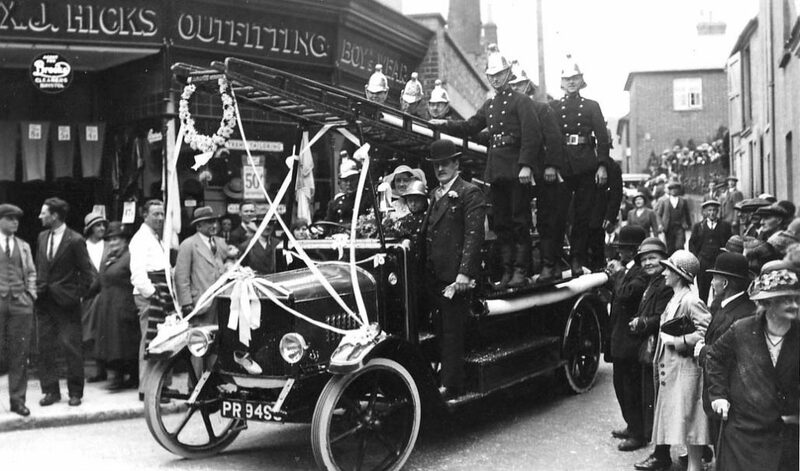 The Fire Brigade in Shaftesbury still used the horse-drawn fire pump during the war, and it was only replaced in 1926, when the Grosvenor Hotel caught fire, and four fire brigades were called to attend it. The new motorised fire-engine cost £400.